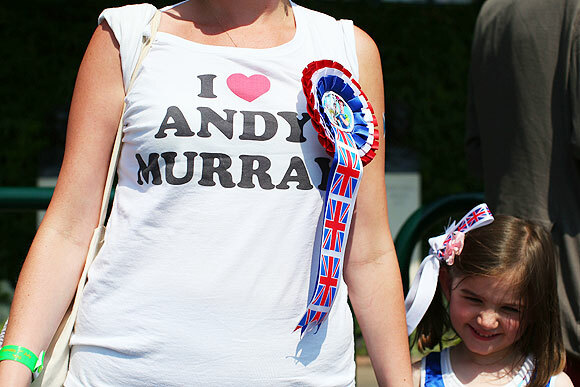 Waving Union Jack flags, thousands of British tennis fans, sports stars and celebrities descended on a scorching Wimbledon on Sunday as Andy Murray ended Britain's 77-year wait for a men's singles champion at the All England club. The Scotsman defeated World No 1 Novak Djokovic 6-4, 7-5, 6-4 in a contest that lasted just over three hours. With "Murray Mania" in full swing, tennis fans camped overnight to get in to the grounds as soon as the gates opened to secure good spots on a hill recently nicknamed "Murray Mound" where the match was broadcast live on a giant TV screen. By 7 a.m. tournament organisers were advising people that all the ground passes for the day had been taken, even though ticket touts lining the road from the nearest station had some ground passes on sale. Tickets to the match were like gold dust since Murray beat Poland's Jerzy Janowicz in the semi-finals with website viagogo reporting massive interest and tickets up for sale at a record 71,000 pounds for a pair. This was over 320 times more than the 260 pound face value of a pair of final tickets in the official ballot. As a sign of what this match meant to the whole country, the royal box on Centre Court was filled with dignitaries, politicians and celebrities, all personally invited. 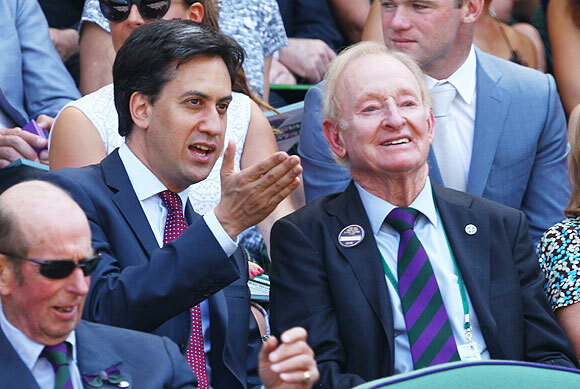 Among them present were Prime Minister David Cameron, Serbian President Tomislav Nikolic, England striker Wayne Rooney, U.S. Open golf champion Justin Rose, and several former Wimbledon champions, including Rod Laver, Stan Smith and Roy Emerson. 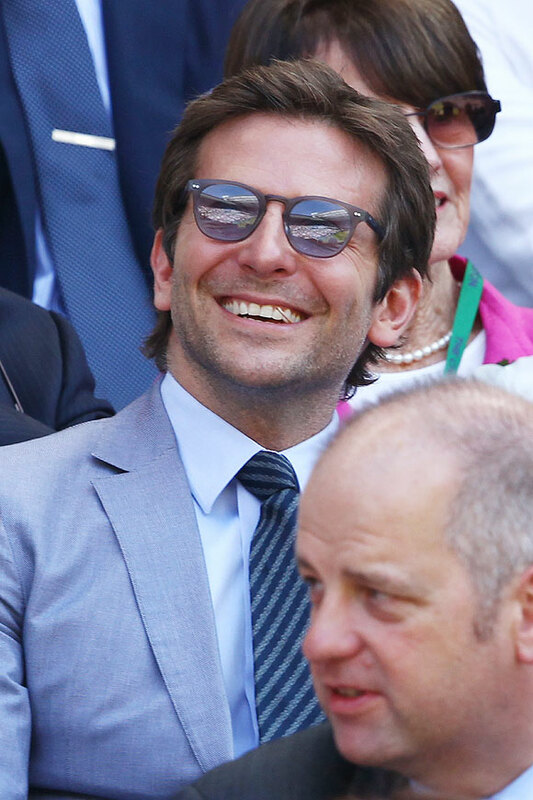 Celebrities in the box included TV chef Gordon Ramsay's wife Tana, Hangover actor Bradley Cooper and Victoria Beckham, the former Spice Girls pop star. 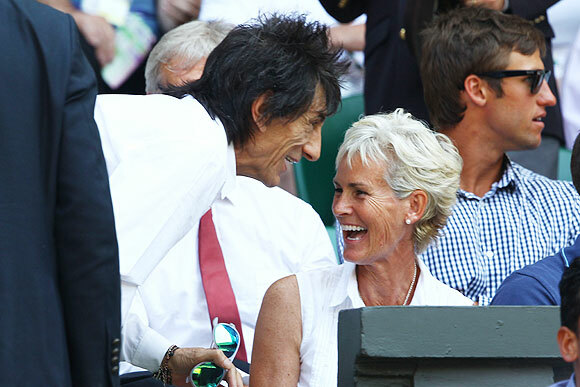 Her husband, former England captain David, will not, however, did not attend the final. One notable absentee was the Duchess of Cambridge, Kate Middleton, who watched Murray's final last year but is due to give birth to the future heir to the British throne any day. 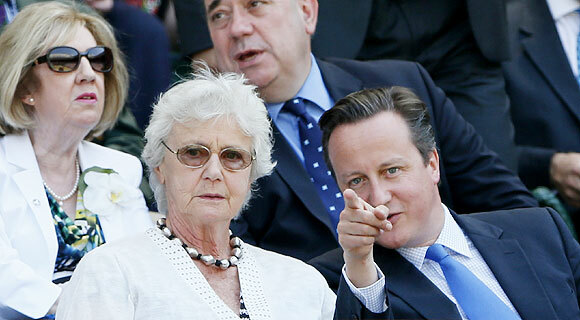 Queen Elizabeth is not a tennis fan and last came to the tournament in 2010 but that was her first visit in 33 years. Murray's mother Judy and his longtime girlfriend Kim Sears were watching as always from court side. Earlier, Prime Minister Cameron had said he hoped Murray would add the Wimbledon title to the British and Irish Lions' win over Australia on Saturday in which they roared to a 41-16 victory in the third test in Sydney to win a series for the first time in 16 years. "A superb result for the British and Irish Lions," Cameron tweeted before British cyclist Chris Froome claimed the overall leader's yellow jersey in the eighth stage of the Tour de France. "Hoping Andy Murray can make it the perfect sporting weekend." In the lead-up to the final, the media reported quirky antics by Murray fans with a butcher in Aberdeen, Scotland, creating a sausage laced with champagne and strawberries and a nail salon offering a Murray Manicure with nets and balls. With the final expected to last several hours, Wimbledon organisers were advising spectators to don hats and slap on sunscreen with forecasts of temperatures rising to 28 Celsius (82 Fahrenheit). "We've already had people fainting. It's going to be a very hot afternoon on court and off," said one steward.